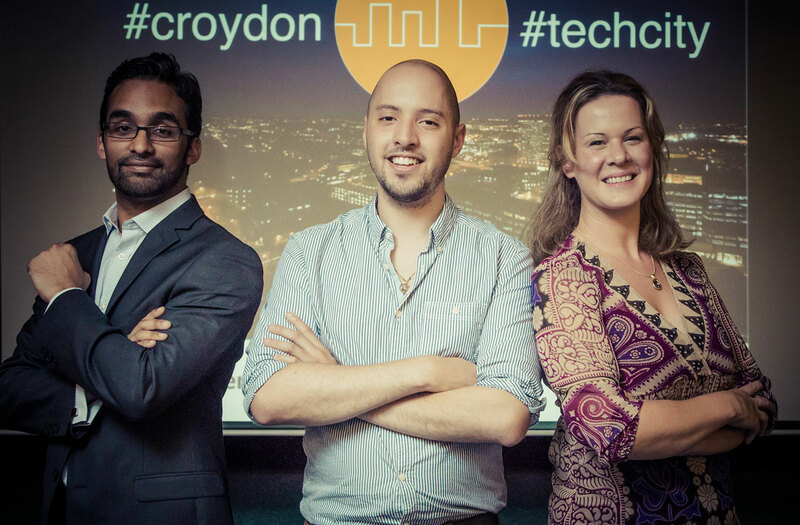 The Croydon Tech City team; Nigel Dias, Jonny Rose, and Sarah Luxford. The first of three trips abroad this year for the Croydon Tech City organisation, to build international awareness of Croydon’s tech cluster and to encourage foreign companies to set up here, started with Nigel Dias in Australia. Notable highlights included touring River City Labs (“Brisbane’s premiere co-working community for tech startup”) and meeting Shark Tank Australia ‘Shark’ Steve Baxter. Minister for the Cabinet Office, Matt Hancock, on a Croydon Tech City tour. Photo by Nicholas Thompson, Cabinet Office, used with permission. Later in the month, Minister for the Cabinet Office, Matt Hancock, toured Croydon Tech City and spoke at the 2016 launch, describing the organisation’s strategy as “a blueprint for the future” for community engagement, education, and economic growth. In February, Croydon Tech City’s three free monthly classes started, and would run throughout the year. The Croydon community is taught Ruby programming, Agile & Scrum project management, and a full ‘Startup MBA’, including lessons on raising venture capital, pitching, and social media marketing. Croydon Tech City was also in Tel Aviv meeting with the UK Israel Tech Hub and our equivalents at Tel Aviv Nonstop. March saw The Exchange Workspace behind Matthews Yard open. The workspace is the least expensive in central Croydon, and offers everything from fixed desks to entire office suites. Photo by The Exchange Workspace, used with permission. Exchange is home to startups such as Thrivo, Estate Apps, and Croydon Tech City gold sponsors, SleepTwitch. Lord Jim Knight speaking at CTC event in Sussex Innovation Centre. April saw Lord Knight of Weymouth speak at a Croydon Tech City event in Sussex Innovation Centre Croydon on importance of digital skills and education for community flourishing. TMRW – a 20,000sq ft council-sponsored tech hub and café – opened on the high street, making Croydon home to the largest workspace in South London. In the same month, nearly two hundred attendees came to CTC’s annual Women in Tech event, with speakers including Jennifer Arcuri, Suki Fuller and Claire Cockerton. London Technology Week saw six hundred delegates attend an all-day Croydon Tech City extravaganza, starting with an open morning in which tours took delegates to various tech companies and workspaces in the borough. The Croydon Tech City Town Hall. Over six hundred people came to Croydon across three CTC events. The midday CTC Town Hall event saw speakers such as SAP’s Head of Startup Recruitment and Salesforce.com’s VP Platform, alongside luminaries from Code Club, Decoded, London & Partners, Croydon Council, and local startup founders – all discussing Croydon’s tech boom and its future. The day culminated with a rooftop party for the tech community with live bands, ping pong, an outdoor cinema and the latest Tesla! CTC visited Japan, stopping off at the British Embassy Tokyo and UK Trade Investment Japan to give talks on Croydon Tech City. Staff at UK Trade Investment Japan flying the CTC ‘flag’. Photo by Nigel Dias, used with permission. In the same month, Croydon Tech City’s mentorship scheme pairing tech startup founders with local experts began. UHY Hacker’s report makes waves when it declares Croydon’s “burgeoning reputation as a tech hub has made it the UK’s fastest growing economy” – a success for the Croydon Tech City organisation and community. The CEO of the London Chamber of Commerce interviews CTC’s Nigel Dias. Photo by LCC, used with permission. The CEO of the London Chamber of Commerce hosted a conversation with Croydon Tech City, to educate members on Croydon’s tech community. A Croydon Tech City collaboration with Carillion Services led to a Croydon Tech City ‘tech den’ for young people opening at Croydon Library, providing the local community with a computer suite and the provision of free tech classes delivered by CTC volunteers. The official launch will take place in January 2017. Come and celebrate 2016’s Croydon Tech City success at the last Croydon Tech City event of the year, on Thursday 22nd December at 7pm at Matthews Yard. Register here to attend.